The next round of protests could get ugly. Despite months of protest, construction of the Dakota Access Pipeline will continue immediately after a surprise ruling by the Army. The pipeline will travel under a major reservoir on the Missouri River called Lake Oahe on the Standing Rock reservation in North Dakota. The $3.8 billion DAPL project has been one of the largest environmental protests in recent years. Indigenous groups opposed the pipeline because it would cross sacred burial grounds and could potentially contaminate drinking water sources. Construction could start as early as Wednesday on the final piece of the pipeline which travels across four states, from North Dakota to Illinois. 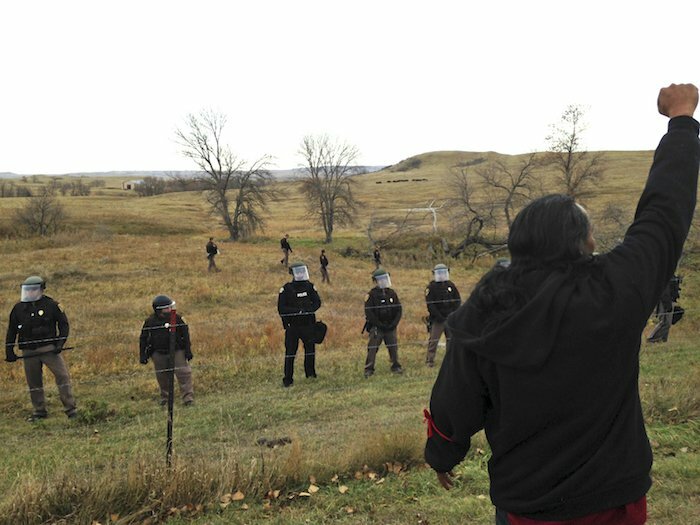 For the second half of 2016, activists from across the country swarmed the Standing Rock reservation, where the protests took place, and confrontations with local police and private security forces broke out for months. In late December, protesters secured what appeared a decisive victory when the Obama administration suspended construction and called on the Army Corps. of Engineers to look for alternate routes that were less environmentally and culturally hazardous. This process was expected to take more than 18 months, but the army granted an easement that allows construction to begin immediately. President Donald Trump issued an order to continue construction of DAPL and the Keystone Pipeline, but both directives were seen as largely symbolic. Opponents of the pipeline will likely begin mobilizing soon to contest the decision, a development that could quickly combust into violence and repression under President Donald Trump who has publicly supported the pipeline.